Your uterus shifts upwards about now, so the pressure on your bladder won’t be so bad. For a little while at least, you probably won’t need to go to the toilet so often. Many women start feeling a little less tired now. Others still feel very low on energy. You might notice brown patches on your face or neck. This is called ‘chloasma’ (or the ‘mask of pregnancy’), and it’s normal. Also normal is the linea nigra, a brown line that shows up on the skin of your belly, running from your belly button to your pubic area. You might see it now, or not until much later in your pregnancy. Chloasma and the linea nigra are caused by hormonal changes that increase the amount of melanin in your body. Many women have their first pregnancy care visit with a midwife or obstetrician, or both, around this time. It’s important to go to your antenatal appointments right from the start, so your health professional can see how you and your baby are going and you can talk about any concerns you might have. If there’s a problem, usually it can be picked up and treated, or checked. Certain tests are also recommended at certain times. Antenatal appointments are a good chance to get health and lifestyle support if you need it and to get information about your pregnancy, labour, birth and early parenting. If you’re not confident speaking English, ask for an interpreter. If one isn’t available in person, ask whether you can have a phone interpreter. You don’t have to pay to use an interpreter. You might also be able to get help from a multicultural health worker to do things like book or check your appointments, fill out forms and get transport to your appointments. Ask if there is a multicultural health worker available. The placenta is working now, sending oxygen and nutrients through the umbilical cord and taking waste products away. Most things that you eat and drink pass through to your baby. This is why you need to eat healthy food, not have too many caffeinated drinks – like coffee, tea and energy drinks – and quit alcohol and other non-prescribed drugs. You also need to check with your doctor or midwife that any medicines you’re taking are safe for pregnancy. This includes prescribed medicines, natural supplements and medicines from chemists and supermarkets. Other things that you might take in, like cigarette smoke, pass through to your baby as well, even when you’re around other people who are smoking. If you need support to cut down or quit smoking, ask your doctor or midwife for help, or call Quitline on 137 848. You can also check out our illustrated guide to alcohol and pregnancy and our illustrated guide to smoking and pregnancy. 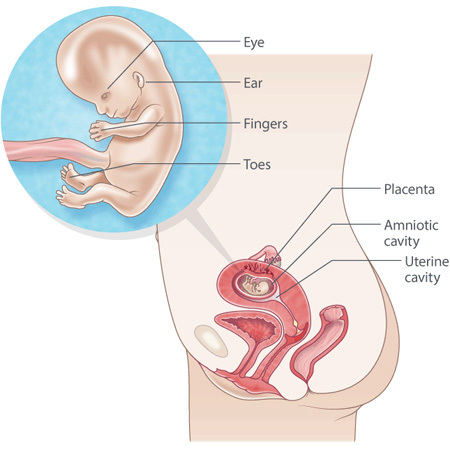 Your baby is about 6 cm long from head to bottom, and weighs about 18 gm. The kidneys are working and the baby can pass urine and swallow amniotic fluid. Your baby’s chest rises and falls, practising breathing movements. The digestive system is also in test mode. Twenty teeth have formed in your baby’s gums.